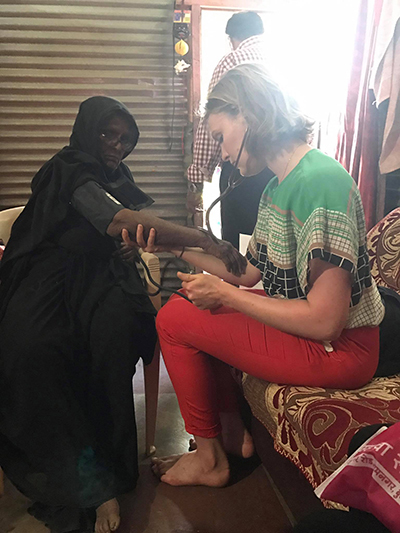 When Holly Sizer found herself in the remotest parts of Tanzania helping to deliver babies and treating people who’d walked many kilometres for medical aid, she knew where her future lay. Until then she’d been torn between a career in medicine, nutrition and journalism, but her brief stint in Africa convinced her that she was destined to become a doctor. “I saw babies being delivered and Caesareans being performed which was incredible and I did some night shifts on the maternity wards. People would walk for a day to come to the hospital and often they would have severe illnesses. I saw things in Africa that I’d never see here but that experience showed me that I really wanted to do medicine,” says Holly, 23. Holly in India for a public health project where she participated in mobile-clinics, which involved screening for diabetes and blood pressure. Holly grew up in South Gippsland and went to school in Mirboo North but she’s now based in Echuca in her third year of postgraduate medicine. She’s part of the University of Melbourne’s Extended Rural Cohort program that offers increased country general practice experience and gives students opportunities to work directly with patients in regional Victoria. Last year she was based in Ballarat. “After high school, I went to University of Melbourne and did Biomedicine. For a while I wondered if I’d be able to do Medicine but I was surrounded by students who were also planning to study Medicine and that gave me confidence that I could do it,” says Holly. Being part of the rural program was part of Holly’s plan from day one. She’d heard it offered students a more ‘hands-on’ experience and that the course offered great mentorship and opportunities to learn and extend skills and knowledge. “One night I was in my accommodation at the hospital and as I stepped out the shower there was a knock on my door. It was the security area manager telling me there was an emergency caesarean happening at the hospital and I needed to get involved. I got to ‘scrub in’ and was in the theatre as an extra pair of hands. I even got to hold the baby afterwards!” says Holly. Holly also prefers the rural and regional lifestyle. She’s joined her local gym in Echuca, runs through the park on a Saturday morning and knows the staff at her favourite cafes. “I like seeing people in the community and then seeing them in the clinic – there’s more scope for connection and you can understand the people you are looking after from a more holistic perspective. I also think there’s less dichotomy between doctors and the rest of the community – everyone is more on the same level in regional areas,” says Holly.